USD is getting strong after the positive reports from the U.S. yields and upbeat U.S. consumer confidence data. GfK Consumer Confidence came less than expected and failed to empower EUR. 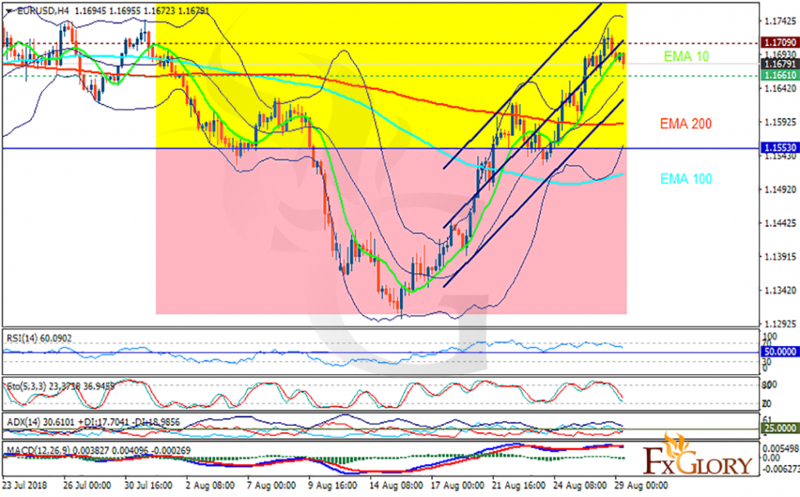 The support rests at 1.16610 with resistance at 1.17090 which both lines are above the weekly pivot point at 1.15530. The EMA of 10 is moving with bullish bias in the ascendant channel and it is above EMA of 200 and the EMA of 100. The RSI is falling towards the 50 level, the Stochastic is showing downward momentum and the MACD line is below the signal line in the negative territory. The ADX is not showing any clear signals. The indicators are showing potential declines as price action is likely to extend down to the lower Bollinger band at 1.155. In case of price growth above the resistance level, buyers can target 1.18.